Just like the new generation of iPod nano was announced earlier this morning, so do we have news of a new iPod touch as well, pushing the device into the third generation. One thing that would disappoint most people about this would be the lack of a built-in digital camera after being hyped up about it through various rumors and fan sites over the past weeks and months, but guess there is always the anticipation of seeing said integrated digital camera make an appearance sometime in the future with the fourth iteration of the iPod touch. What’s cooking with this generation of iPod touch? We’ll take a closer look at it right after the jump. 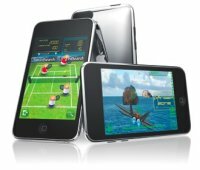 Yes, that’s right – prices for the new iPod touch will start from $199 upwards for the 8GB model, where those who feel that they need more space can always fork out slightly more for the 32GB and 64GB models that will retail for $299 and $399, respectively. Too bad for those who just picked up an iPod touch yesterday, getting half the capacity at the same price – good things always come to those who wait, eh? In this case, it pays to be well informed ahead of time, especially with companies like Apple who announce upcoming events ahead of time so that you can stop your purchase before a particular date if it isn’t too much of a rush. Anyone know when its being released? Where did you find it for sale? Everywhere I look, it says “to be released”. Im happy that they finally got a camera on an ipod but not so happy with which ipod they put it on. Anyone else feel like this? it is very annoying that yhave brought this ipod touch and now it is saying a camera ! they should have the ipod touch then a camera which u can just clip on because i really want one with camera but already brought one with no cameraa…..
Do you get it at such cheap rate ? ?